One of two new mounts being introduced in patch 3.3.3 the other is a wooly white rhino. not sure how to get them yet tho. I think the Wow trading card game is how you get the new mounts. is this 280% or 310% speed? theres one on AH atm. all it says is "Use: Teaches you how to summon this mount." or, does it change to 310% if you already have a 310% mount? Summons and dismisses a rideable Blazing Hippogryph. This mount changes based on your Riding skill. Because I have epic ground and flying, the mount has a 100% ground speed and a 280% flying speed. I don't own a mount capable of 310% so I don't know if the Hippogryph scales to the fastest speed mount owned, but if I get one, I'll make sure to post the info on it. I did a quick test in Kalimdore to see if the mount worked like the Headless Horseman's mount or the Celestial steed; changing to a land-only mount when flying is not an option. The mount is only summonable in areas where flying is allowed. This mount will not substitute for a classic ground mount. It does look pretty amazing though! 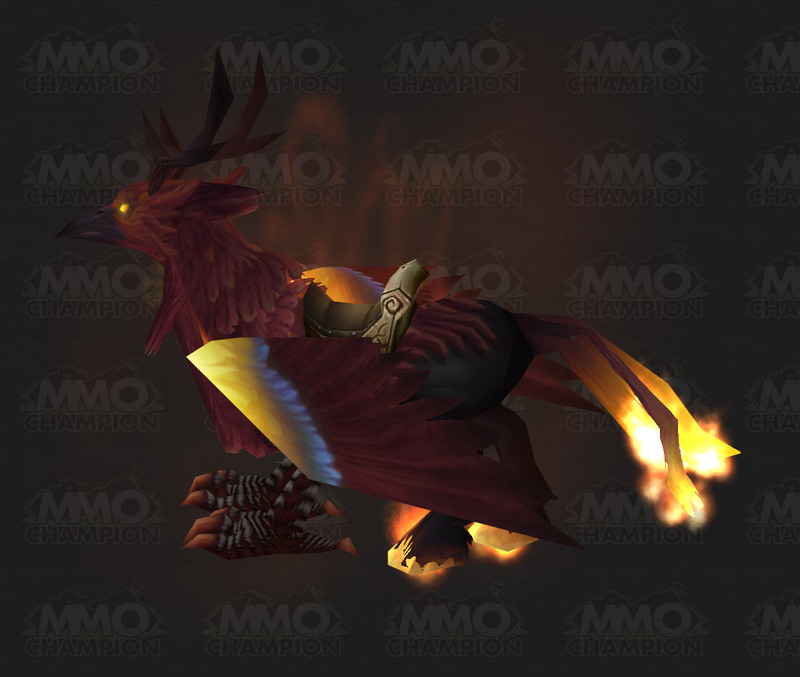 The hooves and tail have a nice fire effect and I like the fact that it *doesn't* have armor; the only hippogryph mount that doesn't. Happy bidding, I ever got this loot card id sell it. Just to confirm that this mount only does 280% flight speed, there were rumours that it was supposed to scale to 310% but I've seen evidence to the contrary. It cannot be used as a ground mount in Dalaran/Old World as it does not count as a ground mount despite what the initial descriptions might have said. This mount is BoE. One up on the AH on Eitrigg US server! Never heard of it til I saw it there. And its only 110,000 gold ;D lol. I took a screenie, waiting for app! I have this mount on a character with 310 flying, it currently does not scale. It seems to be modeled slightly differently than the Cenarion and Argent Hippogryphs, when standing the wings are held lower, and it has a "roaring" idle animation that I haven't seen the others do. Unfortunately the saddle doesn't blaze. too true. I snickered when I saw zomq5's post. it looks so boring. :/ i don't like it. Summons and dismisses a rideable Blazing Hippogryph. The capabilities of this mount depend on your Riding skill and location. "Hippogryphs are highly intelligent, sentient beings; far more than mere "mounts.""